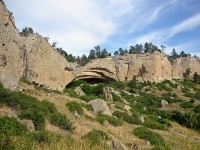 Listed as a National Historic Landmark, Pictograph Cave State Park, located just six miles (10km) south of Billings, provides an ideal setting for a wonderfully scenic, historically fascinating day-trip. Covering an area of 93 acres, the park is home to a complex of three caves, Ghost, Middle, and Pictograph, all linked by a paved walking trail. Two of these three caves contain evidence of habitation dating back over 4,500 years ago. To date, more 30,000 historical artefacts, such as bone tools, arrow heads, and beaded jewellery, have been discovered within the park. The pictographs that give the park its name date back more than two millennia, and their meaning is still being debated by archaeologists. Visitors to the park can anticipate pristine picnic areas, and interpretive signage, which provides good information about the prehistoric paintings, as well as the area's geology and vegetation. Opening times: September, April, and May: daily 9am-6pm (Visitor Center 10am-4pm). May through August: daily 9am-7pm (Visitor Center 10am-6pm). Admission: $6 per vehicle or $4 per person, payable at the Visitor's Centre.